We are pioneers in the world of luxury wedding Mandaps. Zibbi and Sandeep, our directors, take great care in designing each one, working closely with our clients to incorporate their preferences and requirements to each design. If one of our Mandaps isn’t quite right for your event, your vision and our expertise can combine to create a truly special and bespoke design. The Ria Mandap is the newest addition to our collection. Made of real wood and with carving reminiscent of ancient Indian architecture, it provides a stunning enhancement to your celebrations – with or without the grand dome. The Maharaja Mandap is made of real wood, intricately carved. Dotted with gold leaf and with crystals at the base it brings a subtle elegance to your event. 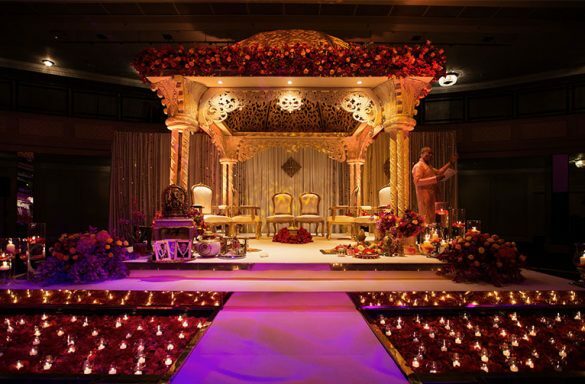 The Maharaja is also unique in that it can be used in two different formations, creating an unusual look that many of your guests will have never seen before. If you’re after a touch of glitz and glamour, the Ratnalekha is the one for you. With its white wood and crystal pillars, the antique and silver finish complements any glittering celebration. With its grand, imposing Roman pillars, the Colosseum is a clean and modern alternative to the traditional Mandap. Beautiful both in indoor and outdoor settings, it allows you to celebrate in simple style. The most unassuming of all our Mandaps, the Rajan’s Mahal, is made of real wood and has a natural looking finish. The elaborate carving on the pillars will give your event a regal look. The imposing, spiral pillars of this wooden Mandap are brushed in light gold and encrusted with amber coloured gems.